Broadsword is one of the rare short weapons in the martial arts of the Taoist holy land of Mt. Wudang. This routine features with movements in arc and circles, zigzag and roundabout, following traditional Chinese steps, integrating with upper and lower thrilling through and crossing, circles and straight lines vertically and horizontally as a whole. 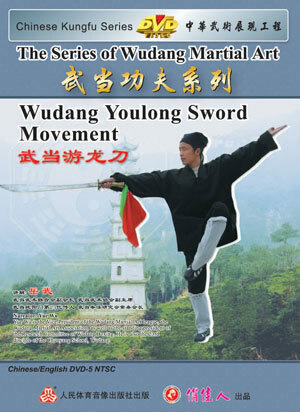 With extending forms and spreading routes and layout, this is a brilliant Wudang traditional weapon routine with a plain and elegant style and swift movements like a swimming dragon which is called "Youlong" in Chinese. The traditional Wudang sword is heavy but for ordinary amateurs, you can use light performing sword. The difficulty of this routine is moderate and is suitable for all ages.